As you cross from Kansas to Oklahoma the small towns are close together. There's Quapaw, named for a local Indian tribe and a few miles further, Commerce, the boyhood home of baseball great Micky Mantle. Then it's just a few miles to Miami. It may be spelled the same as that Florida city but it's pronounced My-am-ah. 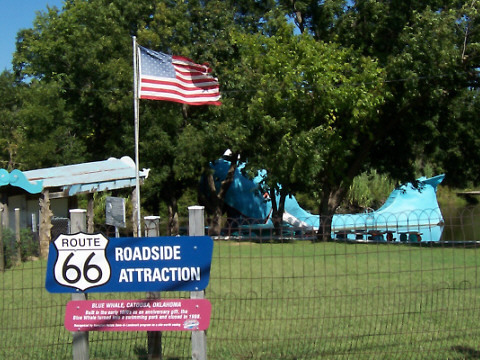 As you enter the northern part of town you can see many Route 66 businesses. Some survive, but most closed long ago. Further on into the heart of the city the restoration projects appeared. The old stores and building of the past have been renovated and Route 66 has been narrowed to make room for trees, planters and benches. And at the heart of this project is the jewel of Miami, the Coleman Theatre. 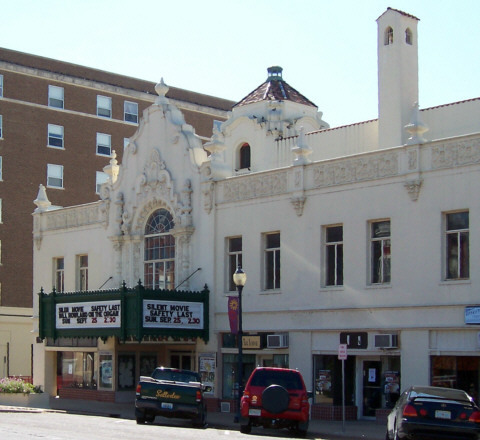 Built in the late 1920's by mining magnate George Coleman, the Coleman Theatre first opened it's doors on April 18, 1929. We stopped by to look and asked if there were tours. The gentleman who was at the door said no, but we could take a quick peek inside at the lobby. He led us in and described the lobby and what was being done to bring it back to the original ornate condition. He, then, led us in further, into the auditorium, onto the stage, backstage, upstairs to the mezzanine and balcony. He told of how some of the original fixtures were found and some were being duplicated and how small scraps of the original carpet were used by a carpet manufacturer to create duplicate carpeting. All in all our "quick peek" took over an hour. As it turns out, our guide was the manager of the restoration project. We thanked him, left a donation to the restoration fund and couldn't believe how lucky we were to see this wonderful old theatre. As you leave Miami you may notice that the country looks very green. Oklahomans call this part of their state "The Green Country" and it's easy to see why. An early pre-1937 alignment of Route 66, very driveable, heads south from Miami on county road 125. 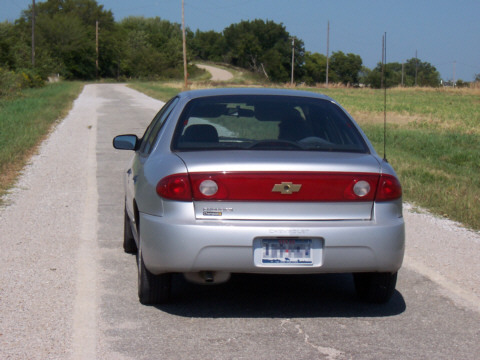 After leaving town and crossing the Neosho river the pavement narrows to just 9 feet wide. This is the famous (well we'd heard of it) 'Sidewalk Highway'. If two cars meet they put their right wheels on the shoulder and hope it's not to soft. We were lucky; we didn't meet anyone. The narrow road continues along property lines north/south and east/west with sharp right angle turns. In about 10 miles you'll be back on OK 66 which you can take for 5 miles to another stretch of 8 foot road to the right (west). This portion, still very used, heads west and south to Afton. 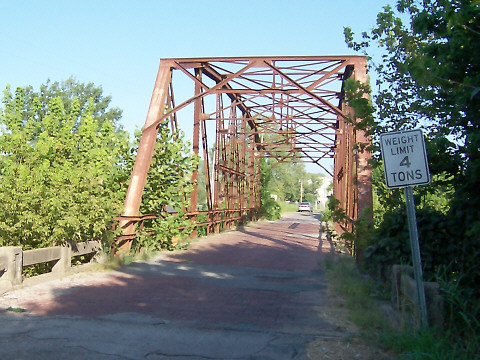 A portion was torn up when I-44 was constructed but a small one lane bridge was built so tourists and a few local residents can still use this historic route. 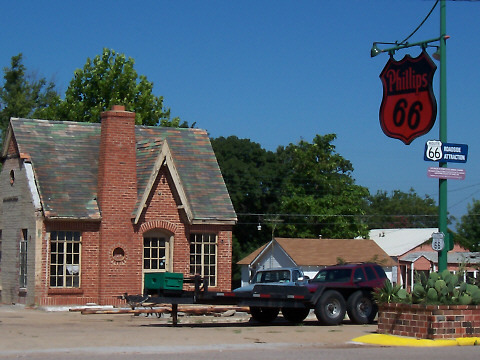 From Afton Route 66 (Oklahoma 66) heads to Vinita, passes under the Interstate, and heads southwest passing through White Oak, Catale, and Chelsea. 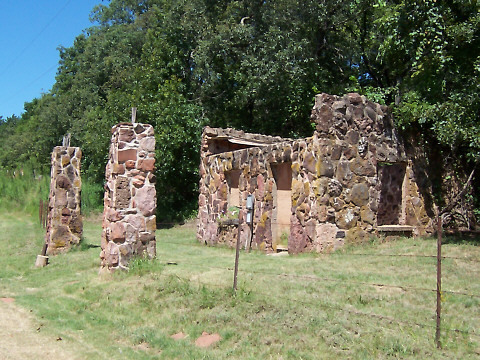 Just before the town of Foyil there's an interesting side trip about 4 miles east on Oklahoma 28A. 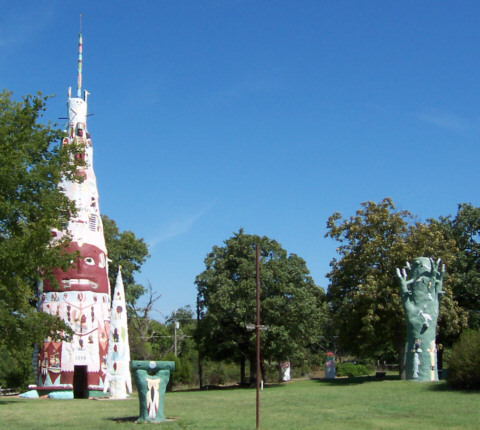 Galloway Park, also called Totem Pole Park, is an interesting collection of folk art. The most obvious is the centerpiece of the park, a giant steel and concrete Totem Pole building supported by an enormous concrete turtle. Ed Galloway spent his retirement years building the park and also many hand-crafted fiddles and pieces of inlaid wood furniture. Much of this is on display in the "Fiddle House", a combination park office, museum and gift shop. Although Mr. Galloway passed away, the park is now being preserved by the Rogers County Historical Society, the Kansas Grass Roots Art Association and the Foyil Heritage Association. South from Foyil the road passes through Sequayah, Claremore, the home of Will Rogers, and Verdigris. Just after crossing the Verdigris River on the photogenic twin bridges you'll come to Catoosa and the Blue Whale. The Blue Whale was built between 1970 and 1972 by Hugh Davis and presented as a 34th wedding anniversary present to his wife, Zelta Davis. It's made of re-enforced concrete with wood walkways and diving platform in the tail. It was built almost completely by Hugh Davis and took him nearly 3000 hours. Coincidently, the cost of all materials was just under $3000. 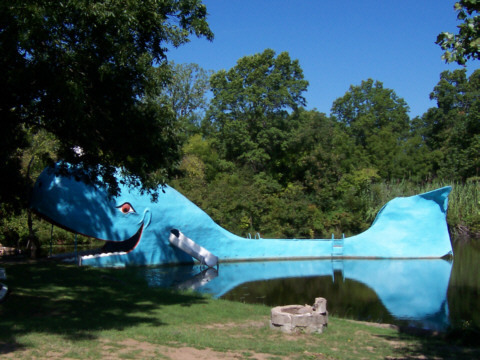 The Blue Whale was a popular spot for swimming and picnicking. The attraction continued until 1988 when, due to Mr. Davis failing health, it was closed. It fell into disrepair until 1995, when the local Chamber of Commerce began a restoration project. The Blue Whale and the picnic areas were restored, but swimming is no longer allowed. After looking at the water I don't think I'd want to try. Just south of the Blue Whale turn right (west) at Ford street to Cherokee and follow an original alignment into the city of Catoosa. Continuing south, under I-44, you can follow this alignment to 11th street and then west into Tulsa. We haven't done much "Route 66ing" in the city itself. But right after Tulsa, almost a suburb, is Sapulpa. The route through Sapulpa is easy to follow; most guide books do well here. 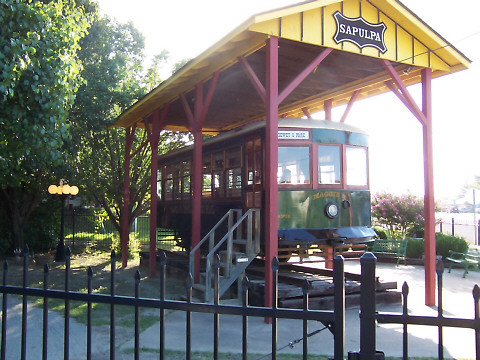 At the Tulsa-Sapulpa Union Railway offices is a restored trolley car from the days of the Sapulpa-Tulsa interurban. It's a beautiful job of restoration on this small single truck trolley. As you leave Sapulpa there's a right turn onto a 1920's era stretch of road called the Ozark Trail. It crosses this 1925 iron bridge over Rock Creek which still has the brick deck. They built things to last in those days. 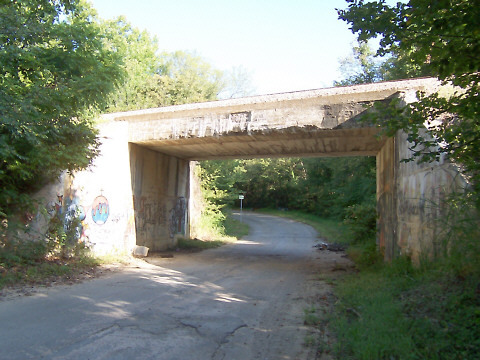 A little further on the road goes under the railroad in this 1925 concrete underpass. Lots of graffiti and junk, but interesting to see the grain of the wood forms that were used when the concrete was poured over 80 years ago. Continuing on through Bristow we came to the tiny town of Depew. It's actually a short loop off the main Route 66. This old gas station was in danger of been torn down, but plans now are to turn Depew into an Artist colony and this station as a part of it. As we drove toward Stroud, about half way between Tulsa and Oklahoma City, I couldn't help but notice how much traffic there was on this 'historical' road compared to that in other states. Then I realized the difference. In Oklahoma most of the Interstate System, including I-44, is toll road. Motorists and truckers take the old road, which is well maintained and in some places 4 lane to avoid the tolls. One famous Stroud business that was here long before the interstate highway was the Rock Cafe. 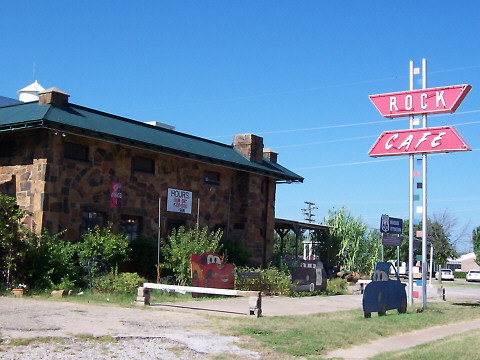 Built with rock dug up when Route 66 was built it's been serving both travelers and locals since 1939. A vintage neon sign, well maintained, is this one in front of the Skyliner Motel near the heart of Stroud. The motel is still open and reviews say it's a great place to stay. 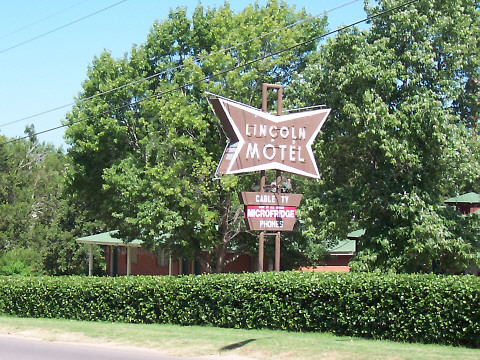 Another historic motel, the Lincoln, is in Chandler. 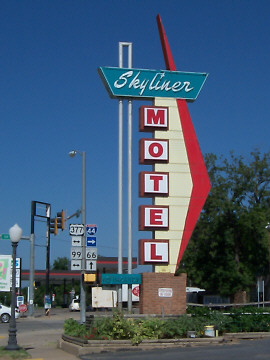 Like the Skyliner it too has a great sign and is still open for business. The green roofed two and three unit buildings looked clean, well kept and inviting. Also in Chandler is this partially restored rare 1930 Phillips 66 gas station. It was being restored when my guide book from 2005 was written and the work was still underway when we visited in 2007. After Chandler the Mother Road wound through Warwick, Wellington and Luther. Just west of Luther is this fine example of a rock gas station. Rocks are plentiful in this part of Oklahoma. According to a sign on this building it was once used by counterfeiters, complete with a 'secret room' in back. But we couldn't find any leftover samples. After Luther comes Arcadia, which is actually about 30 miles from Oklahoma City. 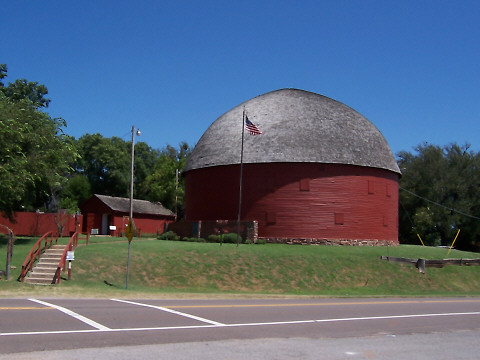 The most famous attraction is the Round Barn. 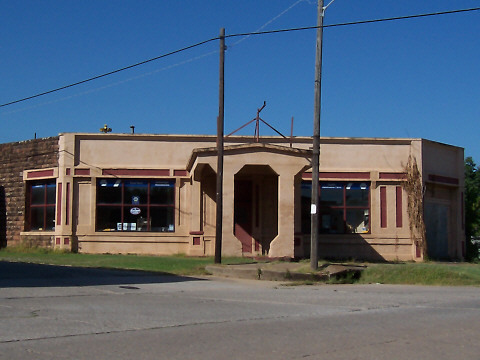 It is multi-purpose, with a museum and gift shop on the ground floor and a dance hall upstairs. As with normal barns, the upstairs was used for hay storage and the lower portion for farm animals. They also have a outdoor display of horse drawn farm implements. From Arcadia it's only a short drive west to Interstate 35 and Edmond, Oklahoma. We stopped in Edmond for lunch at a Steak 'n' Shake, our favorite 'roadside diner'. It's actually on the old Route 66, although the growth of Edmond has completely obliterated any sign of the old road. From here there are two or three alignments of Route 66 through Oklahoma City and beyond. Instead of crowding them all on this page I've made a separate page for the sights of the city. Click the appropriate arrow below to see it.